I remember my days as a revenue officer. 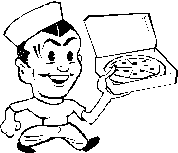 A pizza parlor often frequented by state revenue department employees had a disturbing habit of not ringing in cash sales. They were instead written in a notebook and change calculated on a calculator. That pizza business wasn’t in business long. Today comes similar news from Pittsburgh of two men and their chain of 20 restaurants. This week the two were convicted of tax evasion and conspiracy to defraud the IRS, both felonies. Frank Veltri and John Miller were separately charged for their role in the conspiracy. According to the charge against Veltri, he and Miller own or collect franchise fees from approximately 20 Village Pizza restaurants. The two men are accused of devising a system of tracking payments using codes. If a restaurant’s actual sales were $1305 for the day, an over ring would be added to the register tape at the end of the day indicating an over ring of $13.05. In other words, the decimal point was moved two places. Predictably, cash sales often were not recorded in the register. Because revenue agents can often determine what sales should be by examining food purchases, the two men would pay some employees and food vendors in cash to insure that expenses didn’t appear overstated. Each man faces 10 years in prison when sentenced in early 2015. Federal sentences generally fall within guidelines developed by the United States Sentencing Commission. Those guidelines suggest a sentence closer to two years prison. Although we don’t know how the men were caught, we do the conspiracy went on for many years. Assuming each pizzeria employed 10 people, there were 200 people who were either getting paid under the table or who knew that sales were being underreported. Add to the mix vendors who were sometimes getting paid in cash and the high employee turnover in fast food restaurants and its obvious that many people knew about the tax evasion. Quite frankly, we are surprised it took this long for the two to get caught. One disgruntled spouse, boyfriend or ex-employee is all it takes to blow the whistle and get an audit started. Is a couple years behind bars and a felony record worth saving a couple hundred thousand in taxes? Probably not, especially since the taxes still must be paid and interest and penalties will likely double their tax bill. What is the take away from this story? Cash businesses are often audit targets. Secret codes and conspiring with others are considered “affirmative acts of tax evasion.” The secret codes alone are considered “sophisticated means” and can add another 6 months or so to a sentence. Ditto making sure that reported purchases didn’t exceed sales. The criminal information filed by the U.S. Attorney is silent as to state sales tax but we expect another huge assessment will follow. Pennsylvania has a sales tax and state tax agencies share information with the IRS. or by telephone at (414) 704-6731 (direct). All inquiries protected by the attorney client privilege.